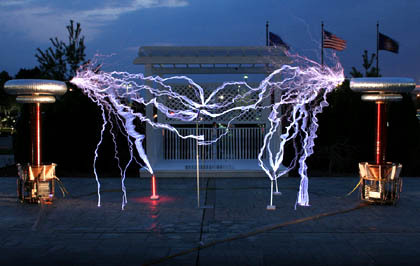 Two eight-foot Tesla coils owned by Masters of Lightning produce an array of giant sparks (Copyright Masters of Lightning). I've always found the idea of using objects in unconventional ways very interesting. For example, way back in 1920 a Russian engineer named L�on Theremin was doing some experimentation for the government with proximity sensors. These are devices that put out an electromagnetic field and can sense when an object interferes with that field though no physical contact with the sensor has been made. Proximity sensors have a lot of interesting uses. For example, airplanes can use them to detect if they are too close to the ground. Some cars have been outfitted with them to detect how near they are to objects when backing into a parking space. A less benign application is to put the proximity sensor into an anti-aircraft shell. This enables the shell to explode when it gets anywhere close to a plane. The shrapnel from the blast will damage the aircraft whether the shell itself would have hit the plane or not. Theremin looked at the tubes, wires and antenna he was assembling to build the sensor, changed a few things and came up with a completely new use: A musical instrument. The Theremin, sometimes also known as an aetherphone, etherophone or Thereminophone is thought to be the first electronic instrument ever made. It is certainly the first musical instrument of any type that could be played without being touched. The Theremin looks a lot like a small box with those old rabbit-ears-like TV antennas, only one antenna sticks straight up and the other one sticks out to the side and loops back to the box. To play it, you wave your hands close to the antennas. One controls the pitch - whether the sound is high or low - and the other controls the volume - whether the sound is loud or soft. The Theremin produces a rather eerie tone, sort of like the sound you get when trying to tune in an old radio. 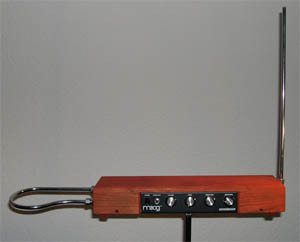 Theremin's invention (or other instruments working on similar principles) have been used in a number of science fiction movie soundtracks including the original The Day the Earth Stood Still and Forbidden Planet. You can hear an Electro-Theremin (a variation of the Theremin with a different control mechanism) in the Beach Boys 1966 classic song Good Vibrations. The Theremin also inspired inventor Robert Moog to build his ground-breaking Moog synthesizer in the 1960's which, in turn, was to start a revolution in sound production that changed popular music forever. Just recently I came across another group of innovators who are again using electrical parts in unexpected ways to make melody. While I'm not sure their work will inspire a revolution in music, it is still kind of cool in a geeky, science way. The device they are using is a Tesla coil, a form of transformer invented by the mysterious, genius Nikola Tesla in 1871 (For more information on Nikola Tesla and his inventions see our bio page on him). 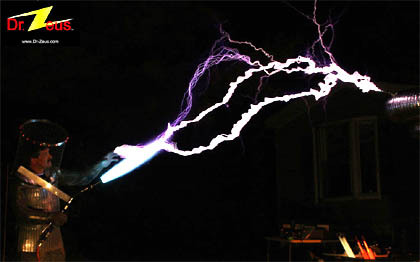 The Tesla coil takes electricity and steps it up to very, very high voltages. It also turns it into an alternating current. This means that instead of the electricity flowing in only one direction (which is known as direct current or DC), it first moves forward, then reverses and moves backwards, then switches to forward again. The number of times per second it does this is known as the frequency. The electricity in your house is an alternating current (AC) that makes this little cycle sixty times a second. Using AC has a number of advantages, including allowing electricity to be more easily sent over long distances. Without AC, a small city would need dozens of power plants scattered across the town to light everybody's home. VIDEO: The Masters of Lightning Tesla coils play the theme from Ghost Busters. In a Tesla coil the AC is cycled not just sixty times a second, but up to 2 million times a second. The transformer itself usually includes a base that sits on the floor, a tube which extends up from the base, and at the top a donut-shaped, metal structure mounted on the tube. The transformer has two "coils" of wire, the primary one on top of the base and the secondary one in the tube. As the transformer charges up the secondary coil with high voltage, high frequency electricity, an electro-magnetic field forms around the top where it is connected to the donut. High voltage currents in the field can actually break out into the air from the donut and tear apart the air molecules creating giant, high voltage sparks that look a lot like lightning. It's an impressive sight. Tesla used his transformers for experimentation and built one at this laboratory in Colorado that could create sparks one hundred feet in length. Today, Tesla coils are mostly built and owned by hobbyists just for fun or by museums that use the coils for public education demonstrations. At this point we should clarify the difference between a Tesla coil and a Van de Graaff generator. Van de Graaff generators are also built by hobbyists and used by museums for demonstrations. They are vaguely shaped like a Tesla coil in that they have a base with a vertical tube topped by a metal sphere. When I was a kid, my elementary school class would visit our local science museum, The Franklin Institute, and they would always select a little, blond, long-haired girl to participate in the Van de Graaff demonstration (blond hair is thinner and lighter making for a better show). They would have her climb up on an insulated box and place both of her hands on the metal sphere. Then they would turn the generator on and it would build up a positive, static electric charge on the ball, and because she was touching it, on the little girl too. Moving a metal wand that was oppositely charged around her head, the demonstrator would cause her long hair to stand up on end because it was positively charged and the wand was negatively charged and the two would attract. This would give the poor little girl the ultimate bad hair day much to the delight of her classmates. VIDEO: Dr. Zeus explodes hydrogen-filled balloons with sparks. A Van de Graaff generator is safe enough to let a child touch because even though it develops some very high voltages, it only supports a very small current (or flow) of electricity. A Tesla coil, however, will often support both a very high voltage and a significant current and therefore can be very dangerous. Hobbyists and professionals give them a very wide berth when they are operating, though for years people believed that the electricity from a Tesla coil would only flow across the top of their skin, not doing internal damage. Studies have shown this not to be true and the only reason someone touching a streamer from a Tesla coil isn't screaming in pain is that the high frequency is too fast for the human nervous system to follow. While it is really rare for anybody to be killed by a Tesla coil, getting zapped isn't good for you either and there is always a small chance of a fatal accident. Like all hobby enthusiasts, people who build Tesla coils for fun have their own moniker. As Star Trek fans are referred to as "Trekies" or "Trekers" (depending on who you ask) Tesla coil hobbyists are known as "coilers." And just like Trekers, they have their own meetings and conventions where they can dazzle each other with new tricks in the field. What I found interesting is that in the last few years people have figured out how to turn Tesla coils into musical instruments. The device has been given several names, but my favorite is the Zesuaphone: a play on the sousaphone with the Greek God's name substituting for that of the musician John Philip Sousa. How does a Zeusaphone work? My theory was that it operated a bit like an AM radio station which uses the modulation of the height (amplitude) of a carrier wave to carry a sound signal. With the coil I figured that they must use the AC as a carrier wave. If I was right, this meant that they could do multiple notes at once. I emailed Jeff Larson, a pioneer in the field, to see if this was true. "The sound we are making with the Tesla coils is produced by turning the coils on and off at an audio frequency," Larson wrote back. "Each time the coil gets turned on there is a bang. If you want a concert A you do that four hundred and forty times per second. A computer does this with ease. Four hundred and forty bangs per second sounds to our brain like a tone of concert A. So from that you can see that it is not like AM radio." So, there goes my theory about amplitude modulation. I asked Larson if it was still possible for the instrument to do multiple notes at once and he replied. "It is possible to do more than one note at a time. We usually do not do more than two notes on one coil, because it starts to sound bad and it draws a tremendous amount of power. Each coil can draw over 60 amps at 240 volts. This past weekend I saw one of the coils drawing over 80 amps." That's quite a bit of electricity. A typical electric dryer at 240 volts only draws about 20 amps. I can see why they recommend giving these sparks a wide berth. At least two groups have built shows around musical Tesla coils. Arc Attack, which hails out of Austin, Texas, and Masters of Lightning from Illinois. Larson is a member of Masters of Lightning along with Terry Blake and Steve Ward. It's Steve Ward's design of this particular type of Tesla coil that makes the music possible. To control when the coil "fires" most versions use a device called a "spark gap." When voltages have built up to a high enough level to jump the distance from one electrode to the next, it goes off. This is a simple and easy arrangement, but there is no good way to control how fast it fires or to change that speed on the fly. Ward's design replaces the spark gap with electronics so that the firing rate can be controlled and the "bangs" produced sound like musical notes. "I thought I would mention that our coils and the coils that Arc Attack uses are Steve Ward's design," Larson told me. "Without Steve's work in the electronics on these coils, I am not sure we would be doing what we are doing at the scale that we are." I haven't had the pleasure of seeing Masters of Lightning in person, but there are plenty of videos on You Tube with their exploits. While Larson and Ward keep a safe distance from the lightning coming off the coils, the third member of the group jumps right in. Blake, in the persona of Dr. Zeus, allows the giant sparks from a pair of eight-foot-high Zeusaphones to spring to his finger tips and run all over his body. The name of the character, of course, comes from the Greek god Zeus who would throw lightning bolts at people whenever he got in a bad mood. In order to perform this trick you might think that Blake must possess similar god-like powers, or at least a total disregard for his own safety. In Blake's case it is neither. What he does have is a suit of chain mail that makes him look a bit like a knight from days of yore. This metal clothing is known as a Faraday suit and when it gets hit by one of these sparks the electricity finds it much easier to travel down through the metal mesh rather than through Blake. This suit, making him a true iron man, allows him to do all kinds of interesting tricks - like shooting sparks to explode balloons filled with hydrogen in time with the music - while keeping him relatively safe. Arc Attack is the other group using musical Tesla coils. The band is led by Joe DiPrima with help from Tony Smith, John DiPrima, Andrew Mansberger and MC/ Faraday suit stunt man Patrick 'Parsec' Brown. Arc Attack puts the emphasis on performing their music live (Masters of Lightning uses a computer to play theirs), but the group does use a robotic drum kit. I don't mean an electronic drum simulator, but a real drum set played by mechanical means and controlled by a computer. They've also occasionally teamed up with Resonance Studio's Craig Newswanger who owns a crazy pipe organ made out of huge PVC plastic pipe. They use the organ, the robotic drum set and coils to produce one of my favorite pieces, the "Creepy Circus Song." If you watch America's Got Talent, you may have seen Arc Attack do their shtick. They beat out a number of other acts to make it all the way to the semifinal performance during season five. During one of their more recent appearances on AGT, they introduced a guitar that can be played to control the coils by a person in a Faraday suit while standing in the lightning. Quite a technical feat when you consider that the sparks would fry any normal guitar electronics and all the equipment had to be hardened against high voltage shocks. Arc Attack has also added audience participation to their show by building a Faraday cage. This works like the suit but doesn't have to be sized to a particular occupant. Volunteers stand in the cage for a song while the lightning arcs around them. During a recent robotics championship meet that the group played for they talked Grant Imahara, of Mythbusters fame, into trying the cage for a number. Mr. Imahara agreed, though he insisted on checking out the quality of the cage's construction first. With that much electricity shooting around him, I can't blame him. So, between these two groups there seems to be a bright future for musical Tesla coils. Now I'm not saying that the Zeusaphones will become standard equipment at most of your better symphonic orchestras. This is a pretty niche musical market. However, the performances of both groups are amazing and fun to watch. They sit at the intersection of science and art, entertainment and education, and I think that's a pretty cool street corner to be standing on. Copyright 2010 Lee Krystek. All Rights Reserved.